The current method of discussing patterns is both antiquated and misleading, as it all revolves around the percentage of payload in a 30 in. circle at 40 yards. It might be a bit more useful if every field shot and every clays shot was taken at 40 yards, but neither feather nor clay seems to stop at the 40 yard line. The current "40 yard method" was already in use back in the 1850’s. Back in January of 1956, Col. E. H. Harrison published "A ‘New’ Method of Evaluating Shotguns" in the American Rifleman, describing the superior German method of evaluating patterns from 1893. The patterns were segmented into 100 parts; the targets called "100 field targets." It was an extremely precise method of evaluating patterns; found to be too precise to be of value due to shot to shot variations. The Germans used a 75 centimeter circle at 35 meters range. While it gave tremendous data at that 35 meters range, it did little to show what pattern performance might be at all hunting ranges. The Germans went back to work, resulting in a huge body of work assembled and finally approved back in 1937. It is important to take a look at the effective spread of patterns. 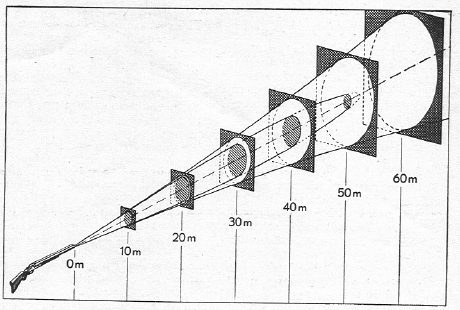 The illustration above gives a rough idea of how a more open or very lightly choked barrel can give us a larger effective spread at 20 meters than a more tightly choked can offer us at ANY range. Instinct might cause us to think that a closer shot is always an easier shot, and that tends to be true, if we have the appropriate pattern to throw. At all ranges out to 30 meters (32.8 yards) we are greatly handicapping ourselves with a tightly choked bore versus a more open choked bore. We get to choose the type of "cigar" we smoke our birds with. This cigar shaped effective spread is largest at about 30 meters, giving us a prime effective spread from around 25 to 35 meters. Effective pattern does not change in concert with range; by 50 meters it quickly thins out becoming more of a rifle shot than a shotgun cloud in effectiveness. At 60 meters (65.6 yards) our effective spread theoretically does not exist. This should reinforce how important it is to look at our individual patterns at the ranges we intend to take game at. As John Brindle determined, it is not possible to have an effective spread with a 12 ga. 1-1/8 oz. shotshell larger than 25 inches across at any range. Lighten the payload, we diminish the effective spread. If we add more choke, we also diminish the effective spread at closer ranges. If we shoot sub-gauges that pattern less efficiently, our effective spread shrinks as well. Soft shot and higher velocities can also shrink up our effective spread. We might all choose to smoke a 1-1/8 oz. shot cloud cigar, the effectiveness of that is all determined by where we want to blow our largest lethal smoke ring. It’s all the same amount of smoke, it is just how we use it. Only the patterning board can tell us what a given combination will give us. What the "best choke" is for any one application is impossible to say without testing. However, the more choke effect we use the higher price we pay at ranges inside 30 yards in terms of a significant reduction in effective pattern spread.